And here’s the alarming thing: in every school, I get the same result. Out of 300 or 400 students, just five hands go up to say they feel hope. I get a similar response from Japanese language students, average age 19. 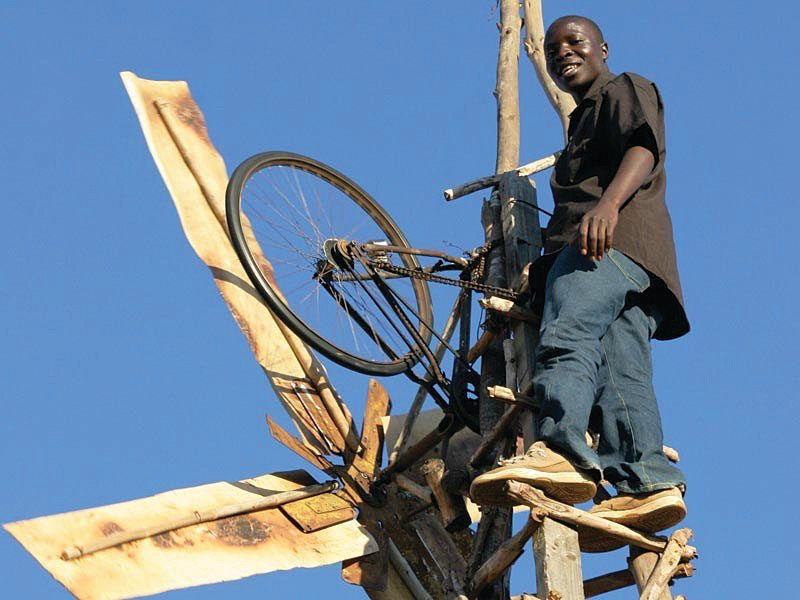 William Kakwamba with his wind turbine. Photo courtesy of TED Talk. It then covers the many solutions to the climate crisis: the astonishing spread of solar and wind energy, the multiple ways in which the world is changing to transportation without fossil fuels, the progress on buildings that are heated with 100% renewable energy. It also shows ways in which students are working in Green Teams to make their schools more green, and offers examples of careers through which students can make a difference in the world. After the presentation, I ask the question again: “When you think about the future of our world, what do you feel—hope or worry?” and this time, half the hands go up—a 40-fold increase. What is happening here? Our teenagers are suffering from an epidemic of hopelessness. Among some, combined with bullying and family troubles, it may even be contributing to thoughts of suicide. And here’s the thing: my presentation is full of photographs. It’s impossible to say, “Oh, solar isn’t a viable solution,” or “Electric cars aren’t going to happen,” when there’s a photo of them already happening. After one presentation a teacher said, “We don’t know this stuff. We only teach the negative side of the climate crisis. We don’t have the tools and information to teach the solutions, the way you did.” She wanted to be able to transmit hope and purpose, but she was bogged down in the need to teach the science, and as a result, her students are receiving the message that it’s all hopeless—we are destroying the Earth. That latter part of that message is true—I’d be lying if I said it wasn’t—but it’s also true that there are millions of amazing people doing amazing things to change this reality, and amazing teenagers, too. Their stories, and the results they are achieving, give us hope. In Holland, the lower House of Parliament voted in May 2016 to end the sale of non-electric cars by 2025. In Germany, the government is preparing a zero-emissions mandate that will end the use of non-elec-tric cars by 2030. In India, the government is planning that all cars will be electric by 2030. In Okotoks, Alberta, since 2007, 52 homes in the Drake Landing Solar Community have been obtaining 90% of their winter heat from solar thermal energy gathered in the summer and stored underground. In Stockholm, 80,000 apartments are being heated with heat derived from sewage. In Bristol, England, buses are running on bio-methane, with advertising on the side with people sitting on toilets, showing where the biomethane comes from. In Barcelona, every bus will be fully electric by 2020. These examples tell a story of powerful cultural and technological change, in which our civilization is making a transition off fossil fuels. Yes, we often screw up and do awful things. History is full of the evidence. But history also tells encouraging stories of progress and discovery, of humans who struggled to overcome poverty, injustice and prejudice, and develop amazing new technologies. So how can we address this epidemic of worry and despair? I have two suggestions. The first is that teacher Pro D days could be used to share the tools and information so that teachers are able to include a stream of positive stories into the way they teach Earth sciences, ecology and climate change, to instil hope into the narrative. The second is that teacher training needs a quick adjustment, adding a stream of content that covers the solutions, the rapid progress being made, and sources of information that can enable teachers to be up-to-date, since new examples of progress are appearing literally every week. “The visions we offer our children shape the future. Right now, we are transmitting a negative vision to our children. And yes, that matters.